In this terrifying thrill ride, college student Natalie is visiting her childhood best friend Brooke and her roommate Taylor. If it was any other time of year these three and their boyfriends might be heading to a concert or bar, but it is Halloween which means that like everyone else they will be bound for Hell Fest a sprawling labyrinth of rides, games and mazes that travels the country and happens to be in town. Every year thousands follow Hell Fest to experience fear at the ghoulish carnival of nightmares. 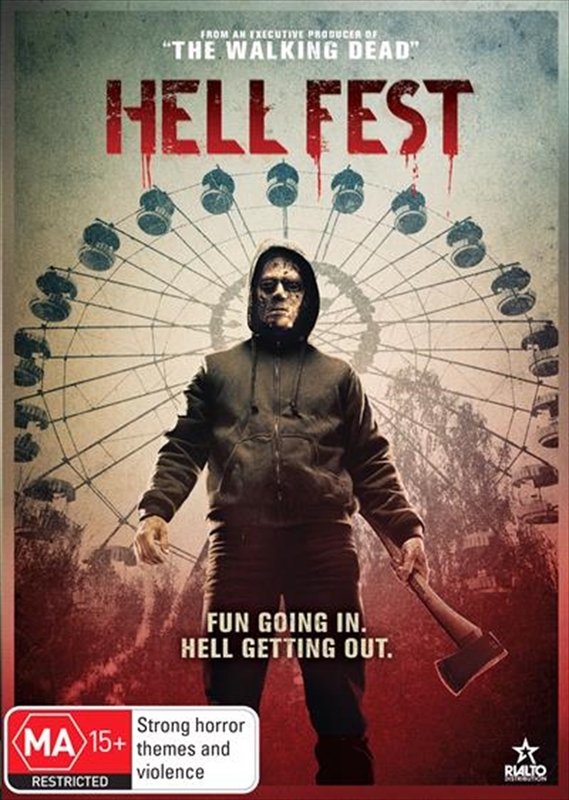 But for one visitor, Hell Fest is not the attraction it is a hunting ground. An opportunity to slay in plain view of a gawking audience, too caught up in the terrifyingly fun atmosphere to recognize the horrific reality playing out before their eyes. As the body count and frenzied excitement of the crowds continue to rise, he turns his masked gaze to Natalie, Brooke, Taylor and their boyfriends who will fight to survive the night.